All of our food is prepared from scratch daily with only fresh chicken breast and USDA select Western Beef. 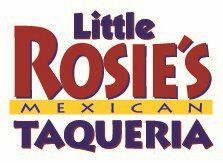 Rosie's chips and salsas, as well as our handmade flour & whole wheat tortillas are also made fresh all day. Try our guacamole made daily from fresh Calavo Avacados or one of our margaritas made with fresh squeezed limes.